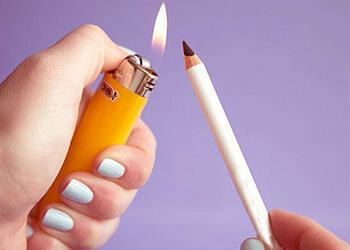 If you notice that your eyeliner rubs off or smudges before the end of the day, you can use gel eyeliner in its place. The problem is that gel eyeliners can be a bit more expensive than pencils. So, just make your own. You just have to take a lighter and carefully heat the tip of any eyeliner pencil and then allow it to cool and create gel eyeliner that looks great and will last all day.